Backlit photographic transparencey in lightbox & wall text installation. Corpus II (After the PJ Patton Collection of Birds Killed Striking Irish Lighthouse 1911 – 1918) is wall text installation comprising of two lists of names: Irish lighthouses and the bird species that were killed striking them as catalogued in the ornithology collection of P.J. Patton, collected between 1911 and 1918 and held at the Natural History Museum, Dublin. 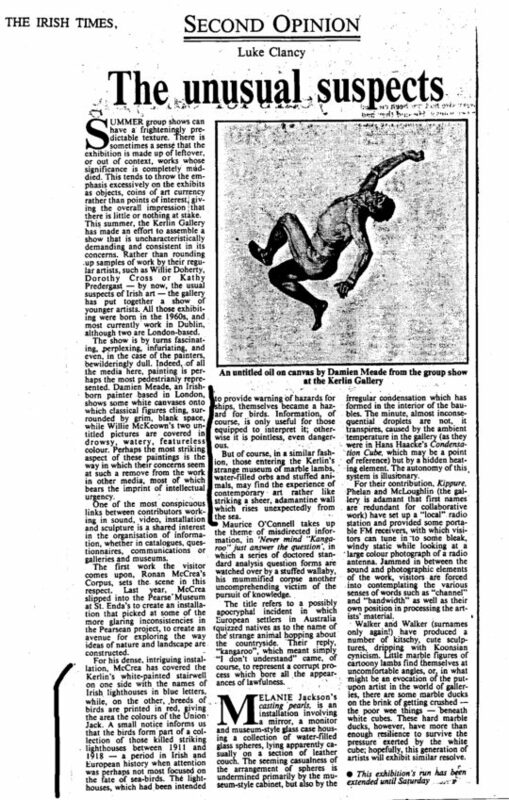 This work was first installed in the stairwell and corridor of the Kerlin Gallery, Dublin as part of Summer Show 1997. 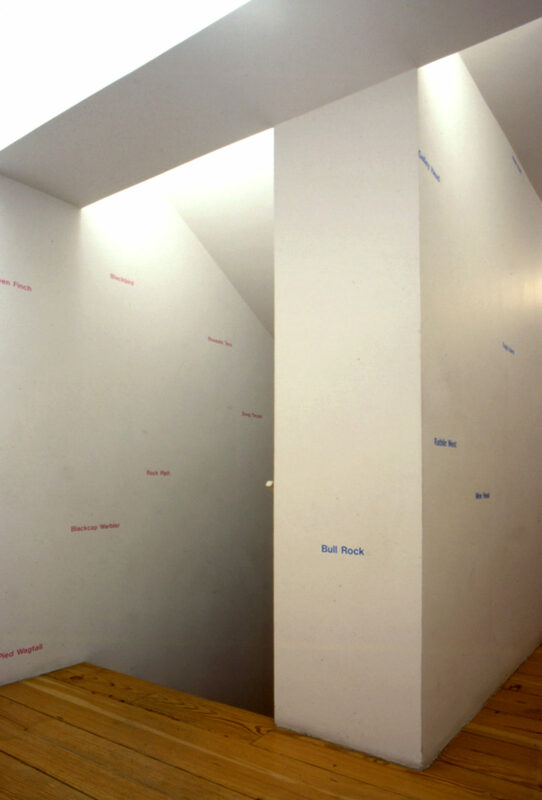 The names of lighthouses (in blue) and bird species (in pink) are painted onto opposing walls in random positions from floor to ceiling. Corpus II (After the PJ Patton Collection of Birds Killed Striking Irish Lighthouse 1911 – 1918) is a kind of re-representation in language and space of the taxonomy employed by Patton, and is activated by viewer standing and moving between the two categories of names. 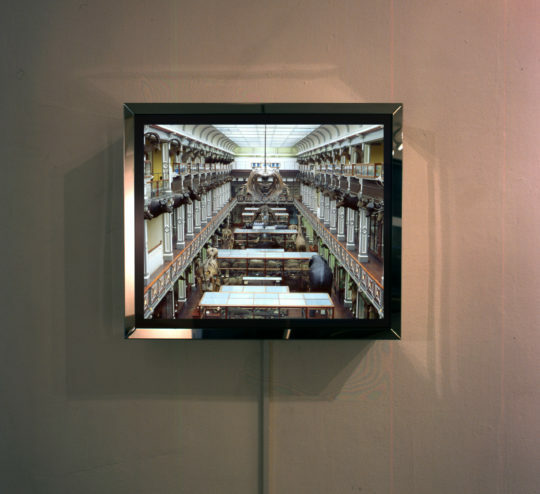 This work thinks about the spatialisation of knowledge and meaning in the historical museum and the notion of the human practice of creating order, category and meaning from fatally arbitrary events. 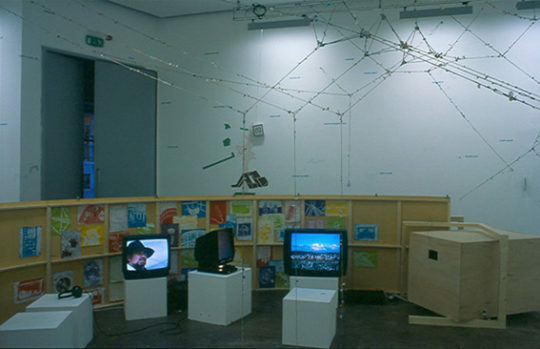 Catalyst Arts: Collective Histories of Northern Irish Art X, Golden Thread Gallery, Belfast, 2013. Curated by Cherie Driver.